1. The weather was spring gorgeous earlier in the week, so I went for a midday bike ride up the river a bit. I stopped along the C&O Canal, where mallards were swimming amidst the cattails (which are the same as bulrushes. Go figure!) where the canal has become overgrown in the offseason. 2. 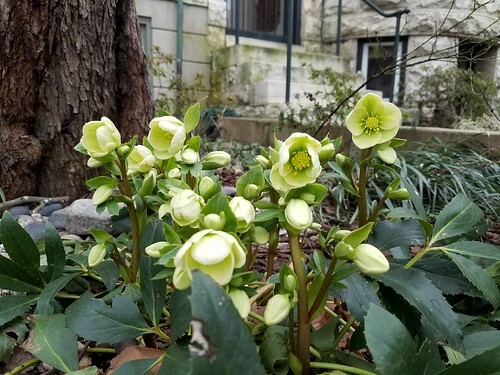 The hellebore in my neighbor’s yard is blooming. 3. I woke up last night sandwiched between Rudi and Corey, who usually prefers not to cuddle while sleeping, but who is branching out. Oh my! That hellebore is gorgeous!